Know a local student who's a community hero? Nominate him for the Daily Points of Light Award! | Back to Basics Learning Dynamics, Inc.
Know a local student who’s a community hero? Nominate him for the Daily Points of Light Award! The Daily Point of Light Award honors exceptional volunteers, celebrating the power of the individual to spark change and improve the world. 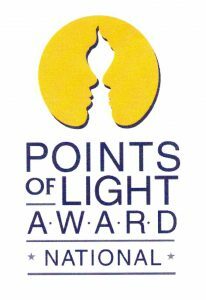 Now you can nominate a local hero for a Daily Point of Light Award. Award nominees must be legal U.S. residents. All volunteer activities of the nominee must be unpaid and cannot include court-ordered community service. Nominees who receive a nominal stipend for their service or receive paid time off to volunteer are eligible. Volunteer service must last for six uninterrupted months and still be ongoing (except disaster relief work). Winners will be formally recognized by Points of Light, a media advisory will be sent to their community, and they will receive a certificate signed by the President (and a bit of the world’s spotlight). For more information and to nominate your student hero, visit Daily Points of Light Award. Back to Basics offers 1-on-1 tutoring in 60+ subjects, professional development, translating and interpreting in 21 languages, speech therapy, occupational therapy, behavior specialists, reading specialists, paras, ELL services, homebound services, RTI support, psycho-educational testing and test prep. Plus, Back to Basics Private School is Delaware’s only Department of Education approved 1-on-1 Private School for K-12. We also offer summer school and educational summer camps, original credit and credit recovery, along with unique enrichment options such as music, art and photography. Click Here to learn about summer camps, summer school, original credit and enrichment options! *Back to Basics Learning Dynamics is not in partnership with, or affiliated with, this organization, or the selection committees in any way. This post is simply intended to inform Back to Basics’ clients and readers about relevant opportunities for children, youth, and adults. Nominate a local hero for a Daily Points of Light! Do you know a child who is changing the world? Apply for the Daily Points of Light Award! Returning to school? The Wilmington Women in Business Fresh Start Scholarship deadline is May 15!